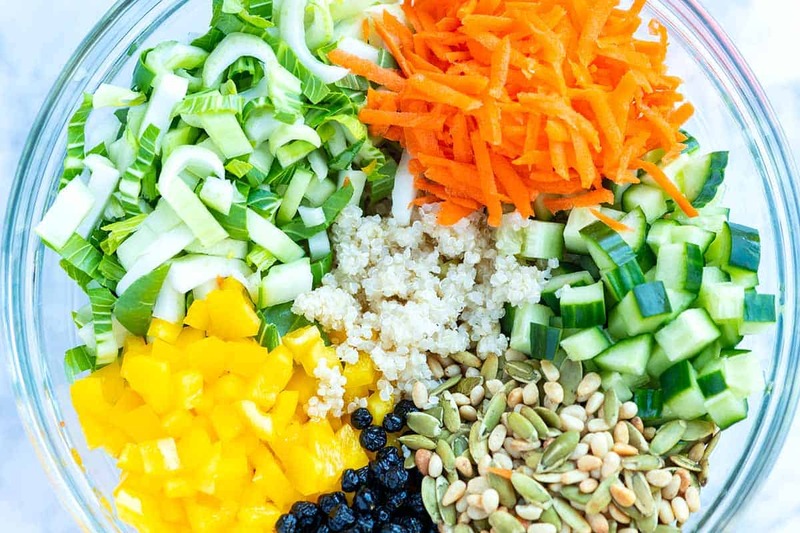 Our ultra-flavorful and satisfying quinoa salad recipe is packed with superfoods. 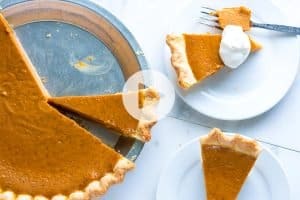 It’s vegan, easy to make, and tastes incredible. Whether you already love quinoa or don’t cook it often, this will become your new go-to salad. It certainly has for us. 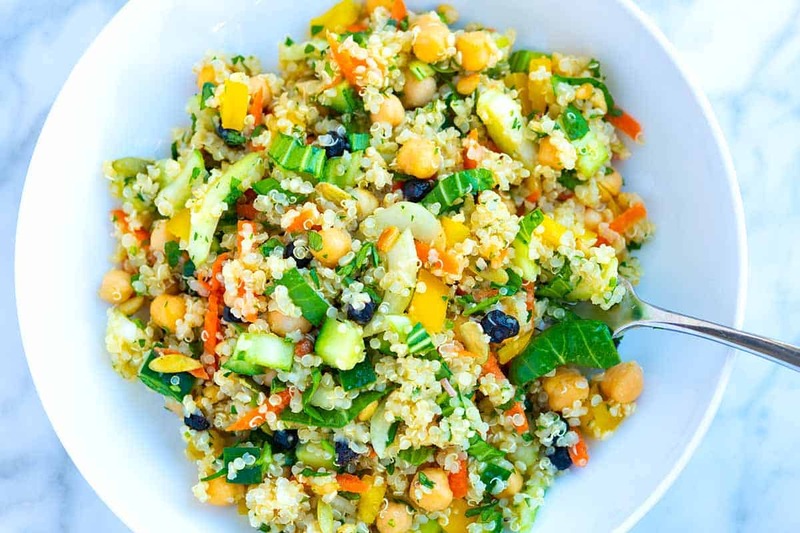 Jump to the Easy Superfood Quinoa Salad Recipe or read on to see our tips for making it. Prepare and cook the quinoa properly. We’ve shared an entire article showing you how to cook quinoa, but here are the main takeaways. First, before you cook it, it’s best to rinse quinoa. Rinsing well before cooking reduces the saponin and produces a delicious nutty flavor. Choose lots of colorful veggies and textures to add to the salad. I’m not the biggest fan of quinoa’s texture, but when you mix it with crisp veggies and crunchy seeds or nuts, I’m a very happy girl. Use a bright and flavorful salad dressing. Quinoa is a fantastic salad base, but it doesn’t have that much flavor by itself. That’s why we love tossing it with an ultra-flavorful dressing. As the salad sits, the quinoa absorbs the dressing and gets more and more delicious over time. What to Put into a Quinoa Salad? We like our salads packed with goodies. Add lots of colorful and crunchy vegetables, nuts or seeds, and something a bit sweet like dried blueberries or cranberries. Cucumber adds crunch and freshness. It’s rare that we don’t add cucumber to salads around here. It’s a star in our lemon orzo salad as well as in our easy chickpea salad. Bok choy is one of my favorite salad ingredients. 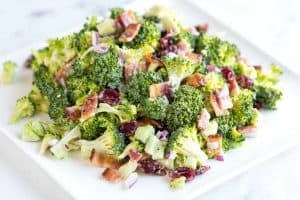 It’s a total powerhouse of nutrition and is the perfect alternative to other hearty veggies like kale, broccoli, and spinach thanks to its milder taste and crunchy texture. If you enjoy bok choy as much as we do, take a look at our 10-minute lemon garlic bok choy recipe, it’s a total winner. Grated carrots add color and are loaded with vitamin A and antioxidants. Grating them is quick, too. We use our box grater, but you can buy pre-grated carrots or use a food processor attachment. Bell peppers add even more color to the salad — I especially love using yellow or red peppers for this. They also add crunch and sweetness, not to mention their high levels of vitamin C, B vitamins, and other nutrients. Fresh herbs add color, lots of flavors, and even add their nutrients to the party. We love stirring in a generous amount of parsley and mint. In addition to the vegetables, we throw in some nuts and seeds — the type is completely up to you, but we especially love buttery pine nuts and pepitas. Walnuts, pistachios, almonds, or seeds like sunflower seeds are also excellent options. We also like to add something sweet. 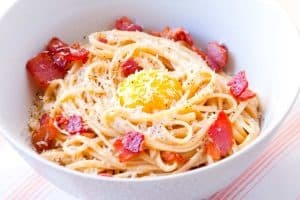 In the photos, we’ve added dried wild blueberries. Cranberries or raisins will also work. If they are in season, fresh fruit will work, too. I cannot wait until summer so I can add a handful of fresh blueberries to this salad. As a final ingredient, we stir in chickpeas, which make the salad even more hearty and satisfying. You can use canned or home cooked chickpeas — here’s our tutorial for how to cook dried chickpeas if you are interested. Other beans, like black beans, work, too. As I mentioned above, it’s all about bright and flavorful when it comes to the quinoa salad dressing. We keep things simple with a combination of apple cider vinegar, Dijon mustard, a touch of honey for balance, and extra-virgin olive oil. When we have them in the kitchen, we love to add a last-minute spritz of fresh lemon to the salad. It brightens everything up even more. As written, this is a vegan quinoa salad — it’s delicious, hearty, and extremely satisfying this way. That said, there are lots of variations you can do to make this salad your own. Serve this as a cold or warm quinoa salad. Give it a Mediterranean or Greek spin with the addition of feta cheese and some sliced olives. Add additional protein with shredded chicken or roasted shrimp. 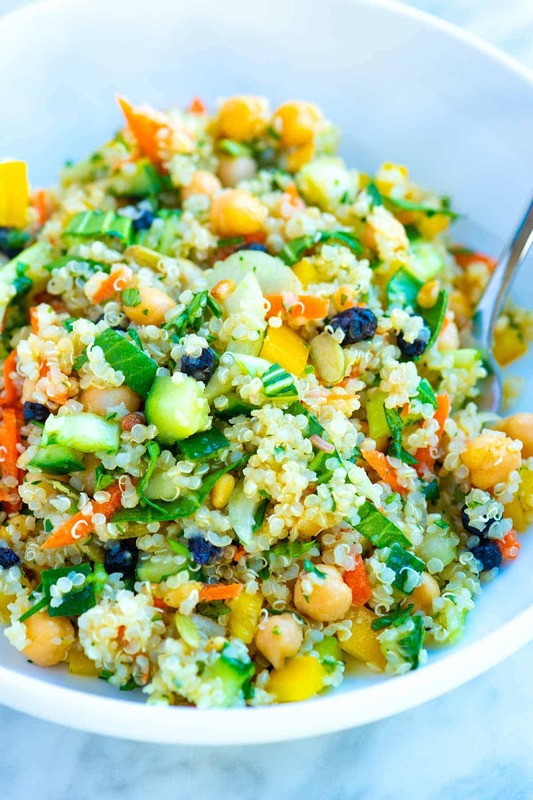 Our ultra-flavorful and satisfying quinoa salad recipe is packed with superfoods. 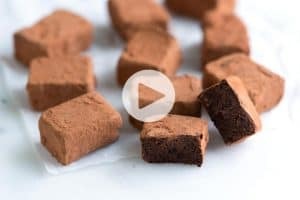 It’s vegan, easy to make, and tastes incredible. Whether you already love quinoa or don’t cook it often, this will become your new go-to salad. We share how to cook quinoa on the stovetop in the recipe, for other methods including cooking quinoa in the microwave or a pressure/rice cooker, see our article: How to Prepare and Cook Quinoa. If you are using leftover cooked quinoa, one cup of uncooked quinoa yields three cups of cooked quinoa. Add quinoa to a fine mesh strainer, and then rinse under cool water for 30 seconds to a minute. Alternatively, add the quinoa to a bowl and cover with cool water. Move the quinoa around the bowl, and then drain the water and repeat once more, so the quinoa has been rinsed. Shake the quinoa of any excess liquid. Combine the rinsed quinoa and water in a medium saucepan over medium-high heat. Bring to a boil then reduce to a low simmer and cook, uncovered, until the liquid is absorbed by the quinoa, 10 to 15 minutes. Move the saucepan off of the heat and cover for five minutes. This extra time allows the quinoa to steam and “fluff up.” Uncover, and then fluff the quinoa with a fork. Set aside to cool slightly. 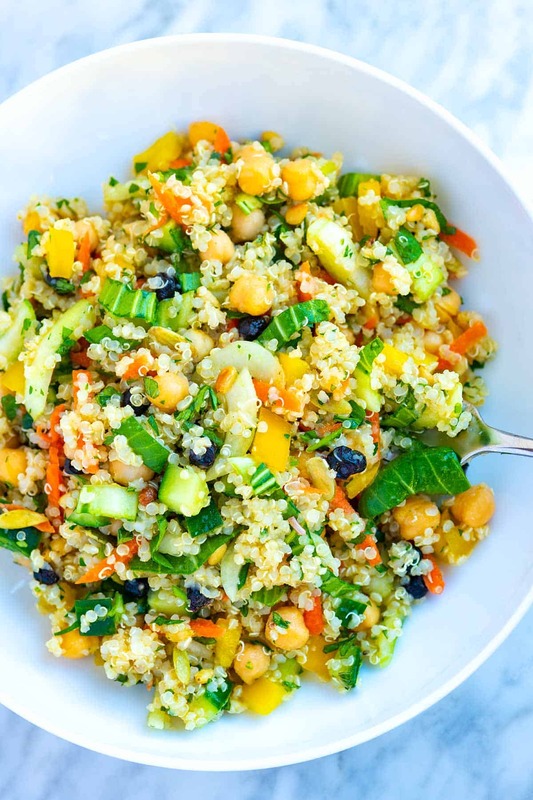 When the quinoa has cooled slightly, in a large bowl, combine the quinoa, chickpeas, cucumber, bell pepper, bok choy, nuts, seeds, dried fruit, and the herbs. In a small bowl, whisk the olive oil, apple cider vinegar, mustard, honey, salt, and pepper until blended. Pour the dressing over the salad and toss well. Taste then adjust with additional salt and pepper as needed. For an extra pop of flavor, spritz the juice from a few lemon wedges over the salad. Serve. The quinoa salad will keep, tightly covered, in the refrigerator for 3 to 5 days. As a substitute for the dried fruit, consider adding 1/2 to 1 cup of fresh fruit like blueberries, diced apple or chopped mango. I made this today for my upcoming work week and it turned out fantastic! I used what I had on hand so zucchini substituted for the cucumber, added red onion and used up some poppyseed dressing. Very nice…thank you!